• Objective. 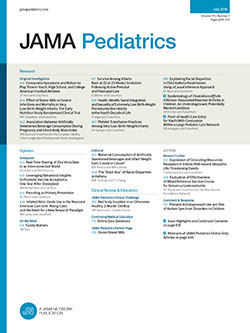 —To test a low-intensity physician's office—based intervention strategy using infant urine cotinine measurements, aimed at reducing infant exposure to environmental tobacco smoke. Design. —A randomized intervention trial. Setting. —Offices of 28 physicians (pediatricians and family practitioners) and two hospital-based clinics in the Greater Portland, Me, area. Participants. —Infants brought to the physician by a parent (usually the mother) for an initial well-child visit. A total of 518 of these infants and their mothers consented to provide information about household smoking habits and to provide a sample of the infant's urine for biochemical analysis. Selection Procedure. —From among the consecutive sample of 518 enrolled mother/infant pairs, 103 mothers reported that they smoked 10 or more cigarettes per day, and these were randomized on an individual basis for intervention (52 pairs) or control (51 pairs). Randomization took place at the study center when the infant's urine sample and information about household smoking habits were received. Intervention. —The physician telephoned the mother to report the urine cotinine result and to explain its meaning. The physician then signed and sent an individualized form letter to the mother, providing specific recommendations for changing household smoking habits. Results. —Follow-up urine cotinine measurements were obtained in 27 (52%) of 52 infants from the intervention group and in 29 (57%) of the 51 controls 2 months later. The mean log ratio of the follow-up to initial urine cotinine measurements was 6% lower in the intervention group than in the control group. This difference was not statistically significant.